This week we bring to you a Gurugram and Delaware, USA based AI startup, which boasts a team of young and passionate technologists who believe in the power of artificial intelligence, and that it is pivotal to building next generation of smart solutions. As the team says, “We eat, breathe and live on building the bleeding edge AI algorithms and deploying them at scale”. To get further insights about the emerging startup, ParallelDots, which recently raised a funding from the US based Multipoint Capital, AIM interacted with the founding team of this 2014 founded startup—Ankit Narayan Singh and Angam Parashar who are IIT Kharagpur graduates, and Mukhtab Mayank, who is a graduate from BITS Pilani. The trio that got together to build a text analytics solution for online publishers, they are enabling search recommendations and article recommendation for bloggers through their NLP solutions. It results in a more advanced and sophisticated results than the common keywords search, that has been a common method. “While building these solutions, we realized that deep learning in particular was showing great promise in natural language processing in India as it made the error rates to come down and generated more accurate results”, pointed Ankit Narayan Singh, Co-founder and CTO, ParellelDots. Since then the team has been developing solutions based on deep learning algorithms and decided to open it for enterprises, so that they can integrate their NLP and AI solutions into their software to build smarter solutions. “We have also ventured into image recognition and computer vision capability, where we have built algorithms using deep learning technologies”, he shared. The startup also flaunts an enterprise offering, where clients can use their APIs trained on standard datasets like Twitter and news articles. “Apart from that, if any enterprise has any custom data on which they want the solution, we also provide an offering by which we can customize our algorithms on their datasets and provide them a solution as well”, he added. They continue to build more algorithms which can do different text analytics capabilities. The startup also offers health care service, where they are building artificial intelligence solutions on medical imaging like typically a radiograph such as CT scans or x-ray images, where they are diagnosing various diseases and abnormalities based on imaging data. “We are currently doing pilot in certain healthcare institutions and we want to offer that as a cloud based solution going ahead”, said Singh. The startup is looking forward to offer some sort of the commercial offerings in the second quarter of the year. “Since healthcare is a regulated industry, we are trying to understand the different regulations that are involved before doing any commercial deployment. In the meantime we have published research papers in the healthcare domain—such as a paper where we were able to match the accuracy of radiologists who were detecting brain haemorrhage in CT scans. The other paper is related to detecting cavities, where we defeated the dentist and our algorithm was proven better at detecting cavities in dental experience compared to a panel of three dentists”, he shared. Having developed these capabilities in the last one year in the healthcare domain, they look forward to many more in the coming future. Singh begins with explaining that in the enterprise offerings, their most core focus is market research where there is a lot of data that marketing companies generate. These type of data basically involves lot of unstructured text in the form of surveys and feedbacks, and also they receive data from various different sources so that it is not in a standard format. This results in the marketing research companies doing a lot of manual work to code this data into a standard format. “We are working with one of the largest marketing research companies, Nielsen, where we are developing a solution to help them reduce their manual labour by almost 70%”, he says. This is one area where the startups is seeing a lot of attraction because for the tremendous amount of data that is generated, the companies are looking for an automated solution to reduce their efforts and cost in terms of human resources. He also shares that in the past, they have worked with Nasscom, where they provided them a solution to help them automate their processes. “Nasscom wanted to track all the development in Indian start up industry and they were manually looking for all the news on Google and other sources. What we did was build a crawler and then use our NLP capabilities to find out which startups were getting funded, which were getting acquired and classified them into different categories”, he explains. They are also working with some US based clients, especially in the area of financial research, which involves a lot of data that an analyst has to read before making stock predictions. They are trying to automate some of the research part involving manual efforts. Since its inception in the year 2014, the startup has witnessed two rounds of fundings. The first was was by TLabs, startup incubator managed by Times Internet, where they were incubated, and recently by Multipoint Capital, where they have raised two-million-dollar funding amount. 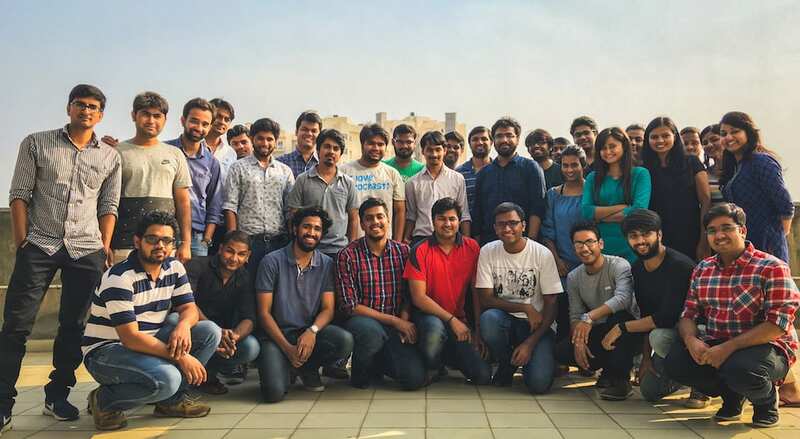 With a team size of 35, out of which 25 people are employed in various technology part like software engineering, machine learning, data scientists, and remaining 10 in various business verticals like marketing, sales and business development, they plan to utilize these funds to expand the technology team, set a global footprint and develop new products. The startup envisions to keep exploring different applications of artificial intelligence into verticals where a lot of data is being generated and replace all the manual working there with automated solutions. “We believe, artificial intelligence will be used across different verticals and that’s the plan”, he said. “We are currently focusing on healthcare and market research and are also seeing a lot of use cases and applications coming from finance and marketing agencies as well. Eventually, we want to build a platform where anyone can bring their own data and carry automated analysis rather than doing any manual intervention. Be it healthcare data, financial data, legal data, or any other form of data, we want to build that capability that can analyse it completely”, he explained. The biggest challenge that Singh believes they face is the lack of talent, especially in deep learning. “We still struggle to find lot of good people who knows about these technologies and who are aware of what other cutting edge algorithms and research is taking place. We still have to take people who do not have much experience in this area”, he said. Since there aren’t many people or companies doing similar kind of work as they are doing, it gets difficult to find such talent, and the startup is struggling to look for it in the USA and other geographies. “The second challenge that we face is related to data. A lot of AI algorithms use a large amount of data and we are trying to collect and label as many data points as we can because most of the algorithms use a lot of data inputs”, he said in the concluding.